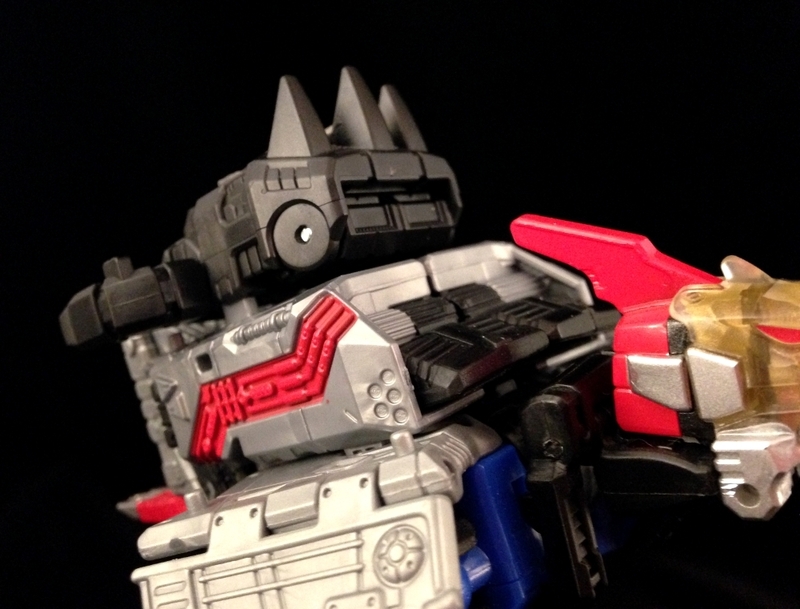 We’re almost done with our Dinobot series of reviews. Up today is the last single figure review, Swoop! You don’t have to beg us to tell you the good part, just read on! Swoop is seen here in his cartoon appearance colors with the blue chest. 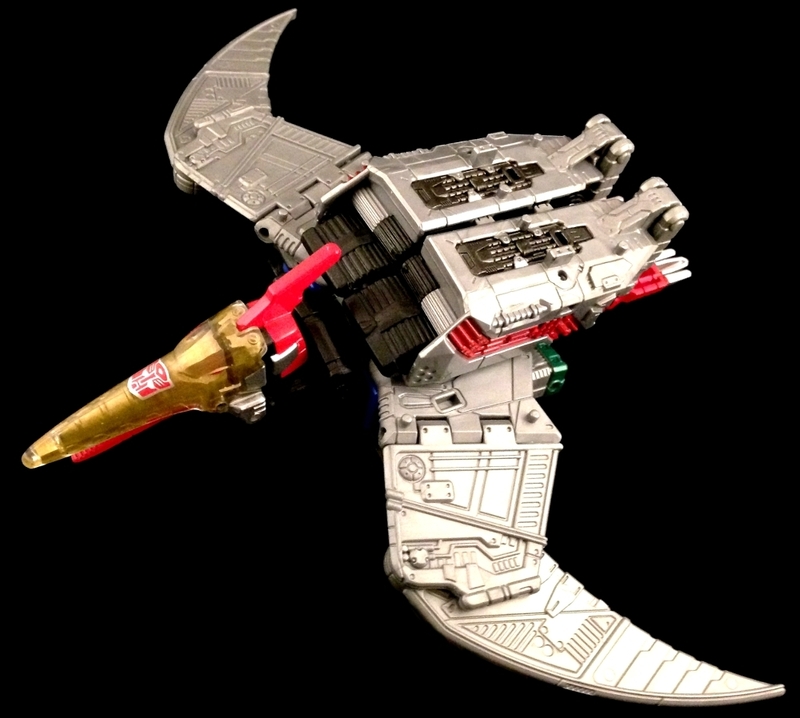 (Also a nod to the original Diaclone toy) Unlike the original toy, the wings point downward instead of folding behind themselves. 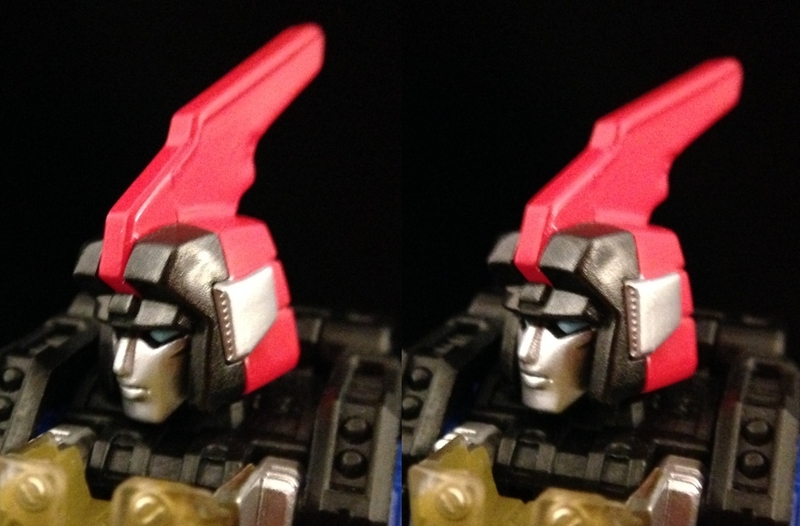 Swoop’s head can turn side to side and look down a bit. Due to the area around his neck, he can not look down when his head is turned to the side. It also can not look up at all. 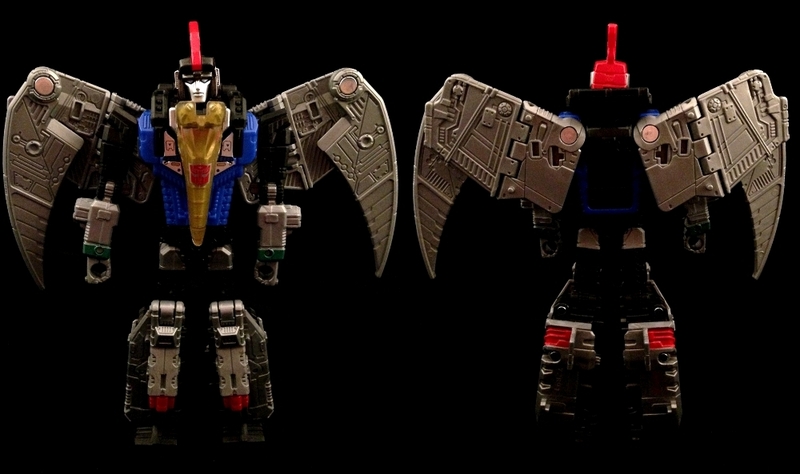 Swoop has all the same articulation as the other deluxe class Dinobots. 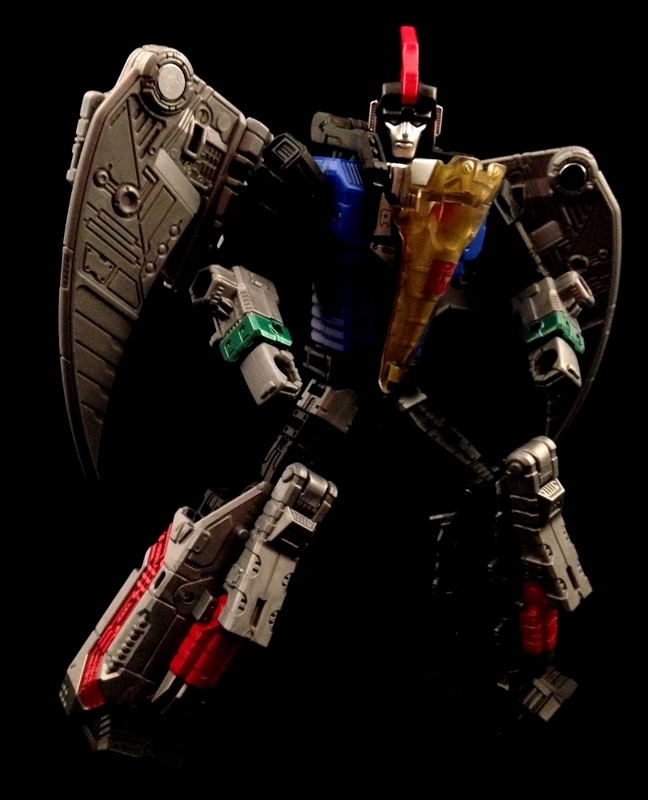 His knees can bend a bit further than some of the other Dinobots and he can point his toes like Slash. 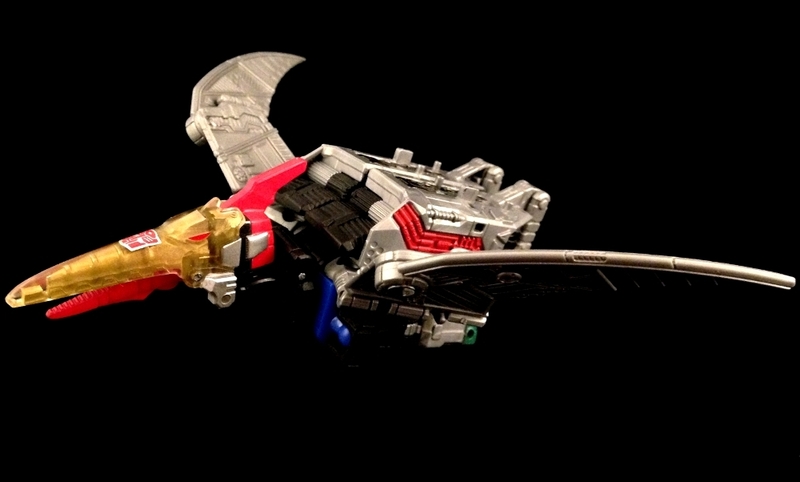 Swoop’s Dino Mode is a lot of fun thanks in part to the articulation of the wings. 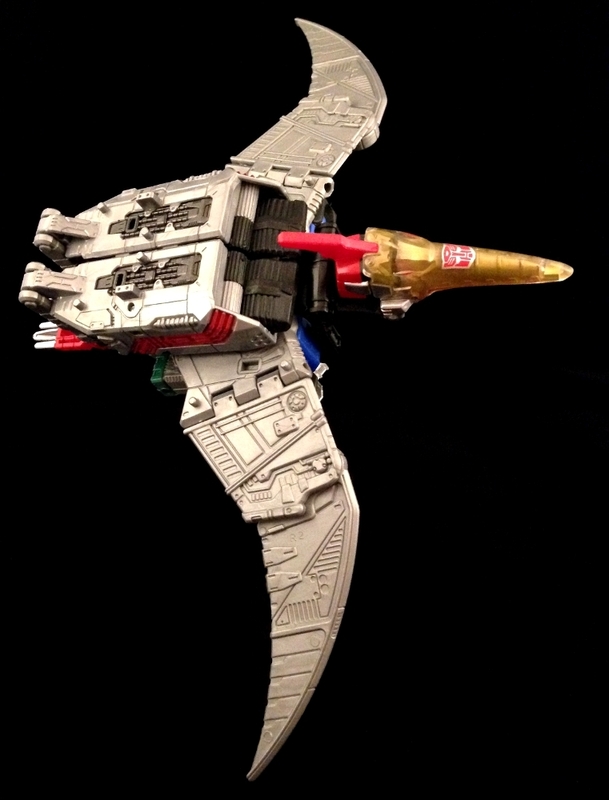 Due to the hinge and the swivel point you can get a couple of different wing positions for posing. 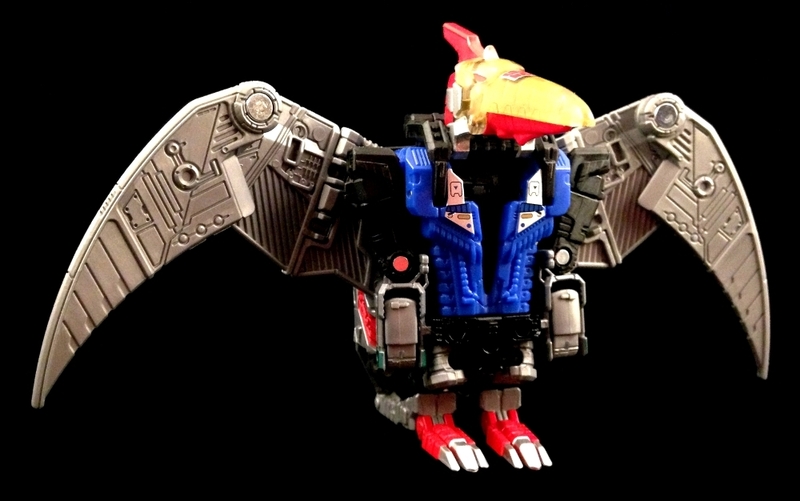 Swoop, of course, has Prime Armor. 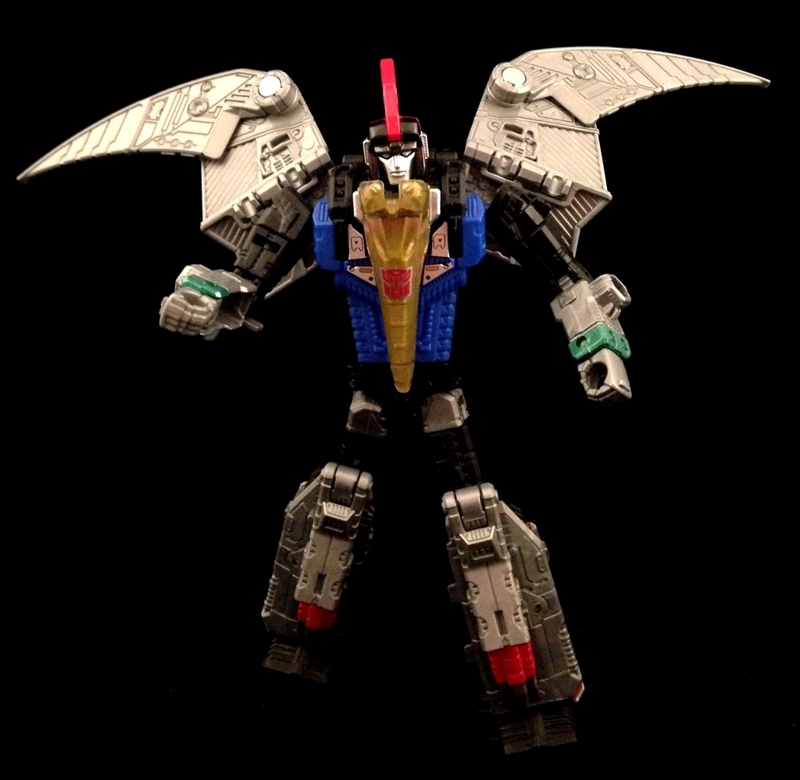 Unlike the other Armors, this one plugs onto two square ridges on Swoop’s back instead of using the round peg on the armor itself. 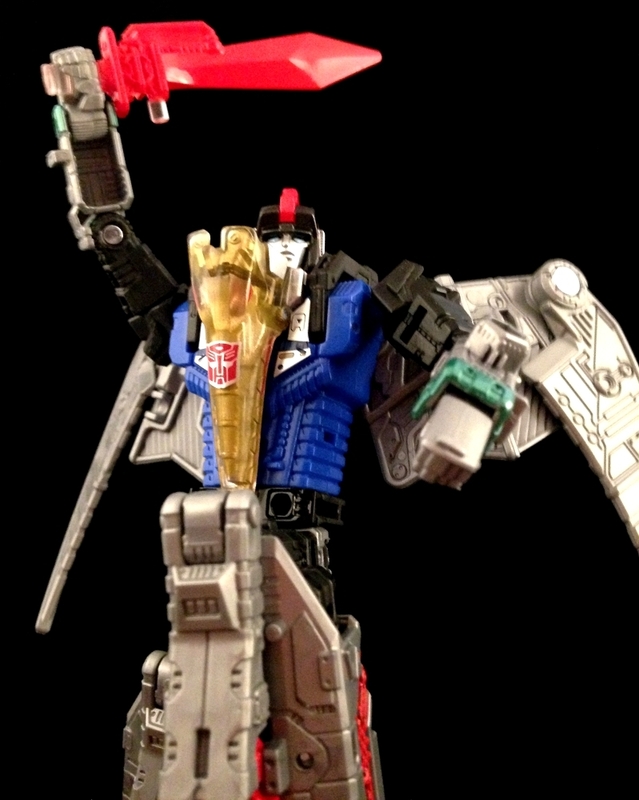 Without the armor, you can see there are four Titan/Prime Master pegs for figures to stand on. 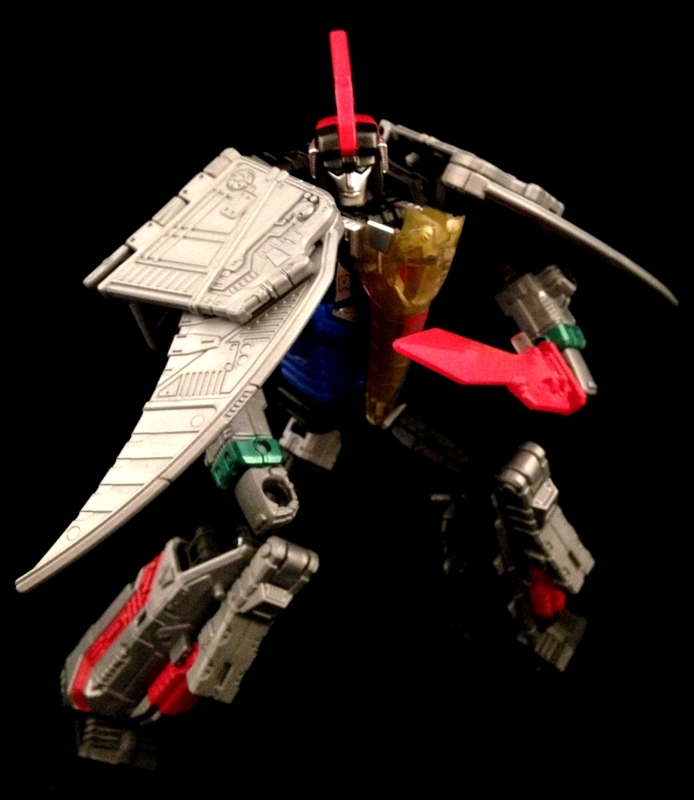 Swoop has the most of these pegs than any other Dinobot. 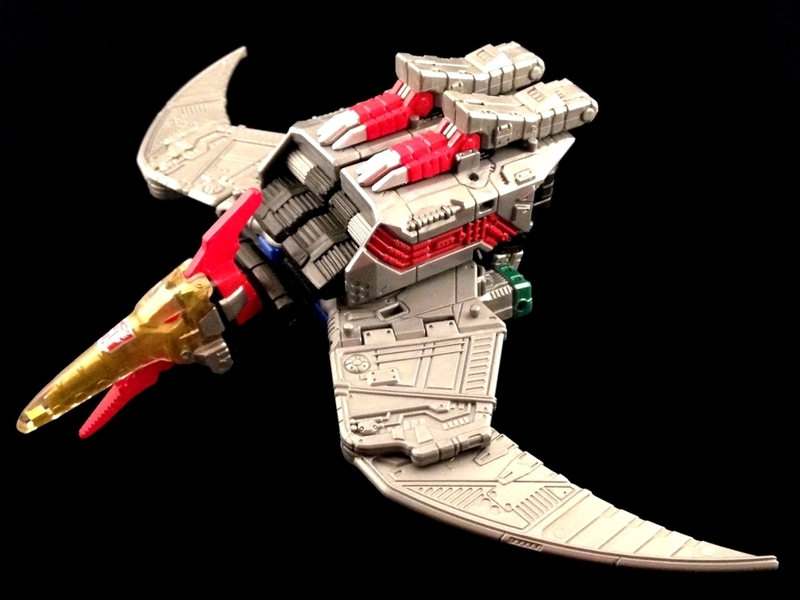 In addition to the four on his back, there are four on his wings too! However, with 8 pegs, you can only comfortably fit seven Prime Masters on there. 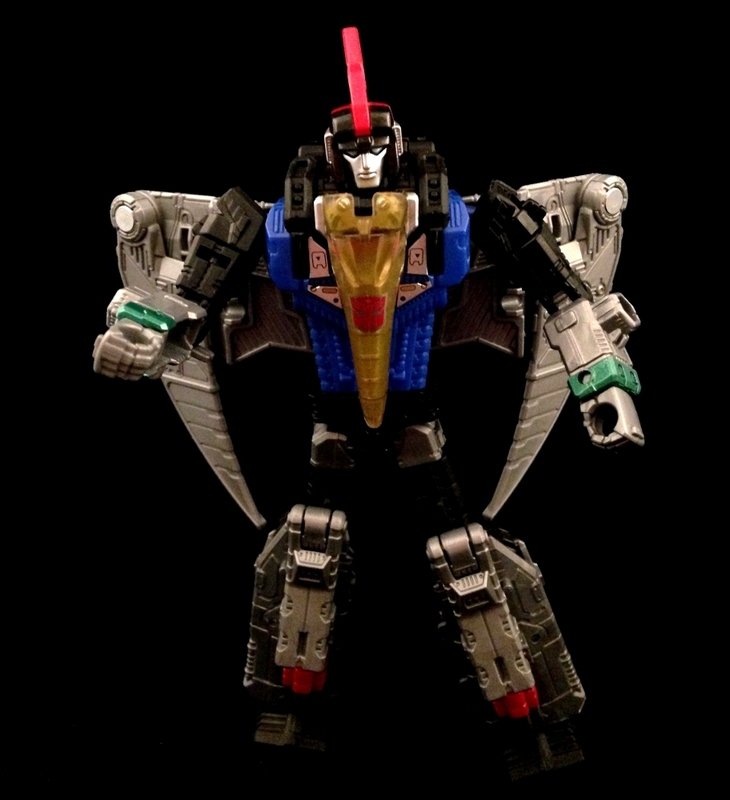 The two pegs in the middle of his back work like Sludge’s and appear to be for one Prime Master. 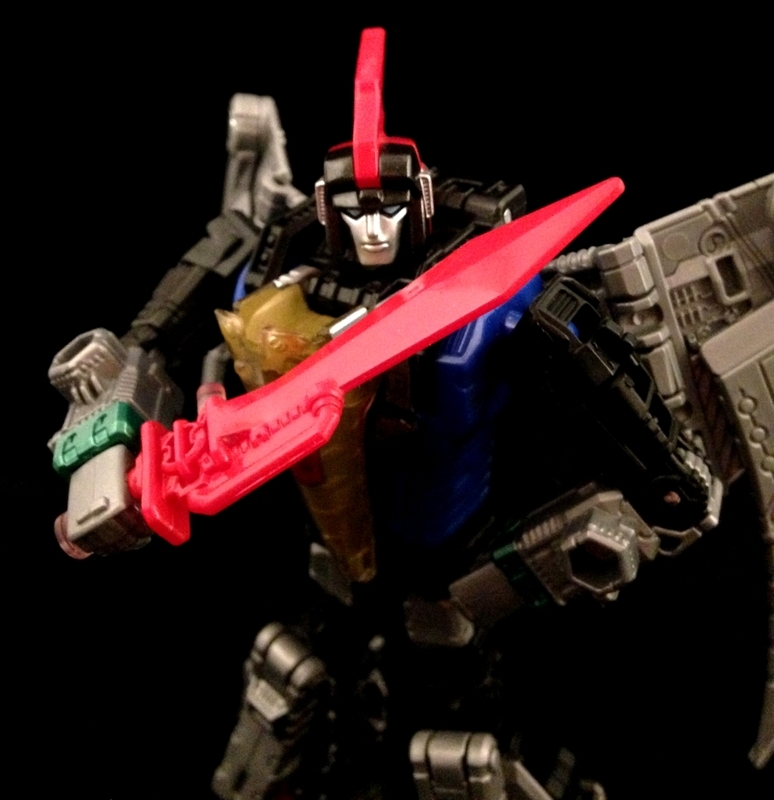 The Sword can be plugged into a hole under Swoop’s chin. 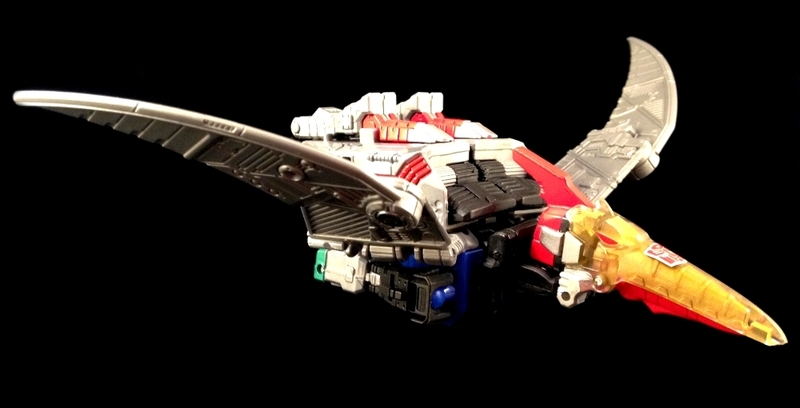 Swoops Dino feet and head can swivel so that you can either have a flight mode or a standing mode. This is a super nice touch as many times Swoop would stand around in Dino Mode asking Kup to tell stories. Especially the good parts. 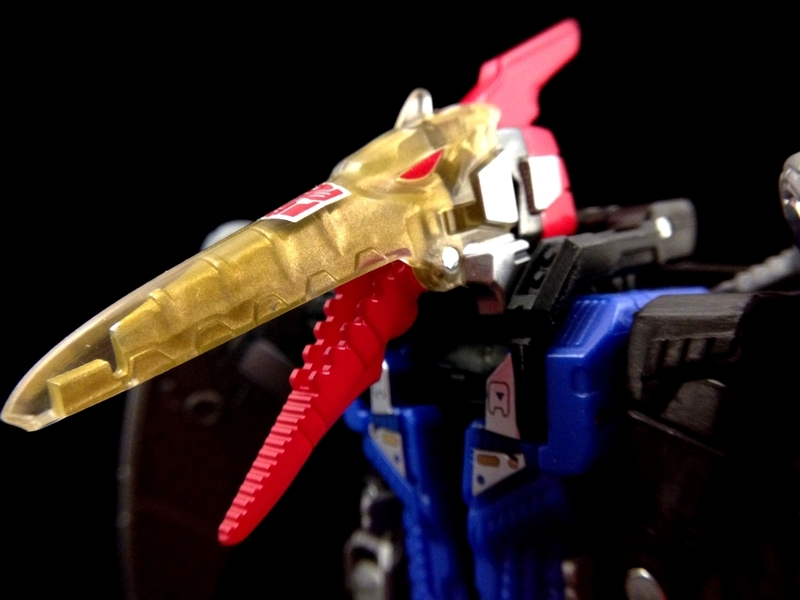 The Dino beak is the only clear gold piece here, but it looks good. The mouth can open and close as well. I’ve found the beak doesn’t stay flush against the head too well unfortunately. There’s not really anything locking it in place and it will move forward a quarter of an inch at times. This can create a bit of a gap between the beak and the head crest. 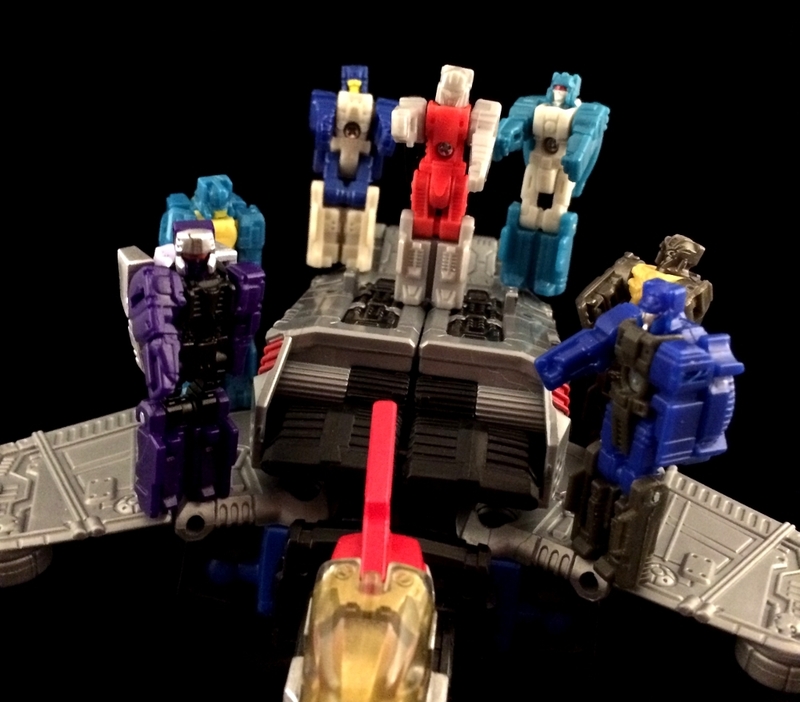 Thanks to all the articulation Swoop has, there are a couple of different Fan Modes you can make up. 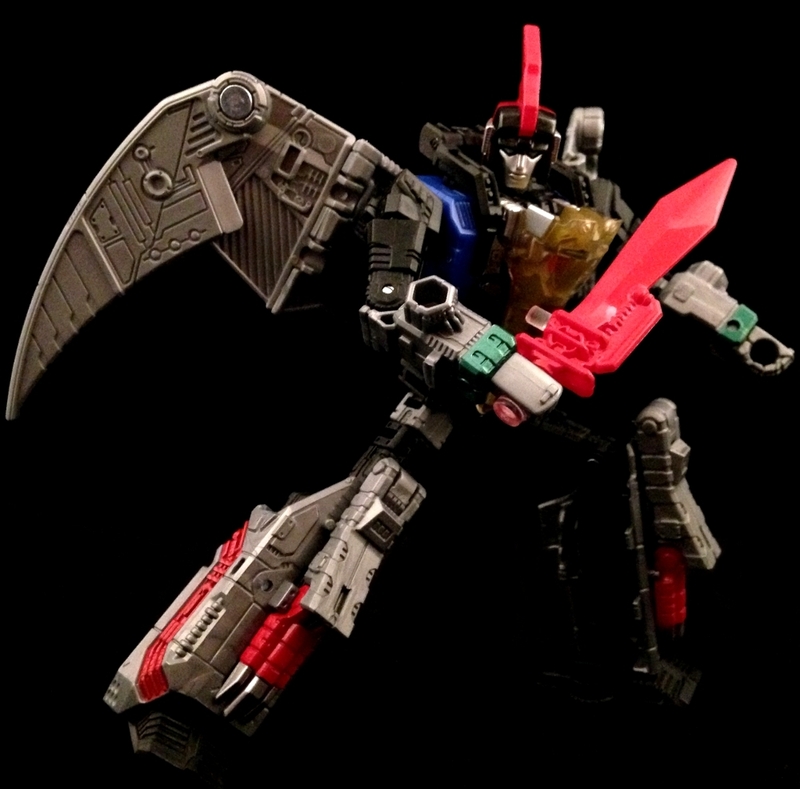 I like this Gundam looking robot mode and I find myself constantly leaving the Dino Feet on Swoop’s back in Dino Mode. I saved Swoop for last because I thought he was going to be the most difficult to transform and photograph. Once I found a stand for his Dino Mode and started messing with all of his articulation, he wound up being my favorite! I think all of the articulation really adds to the fun being able to choose multiple poses for each mode. 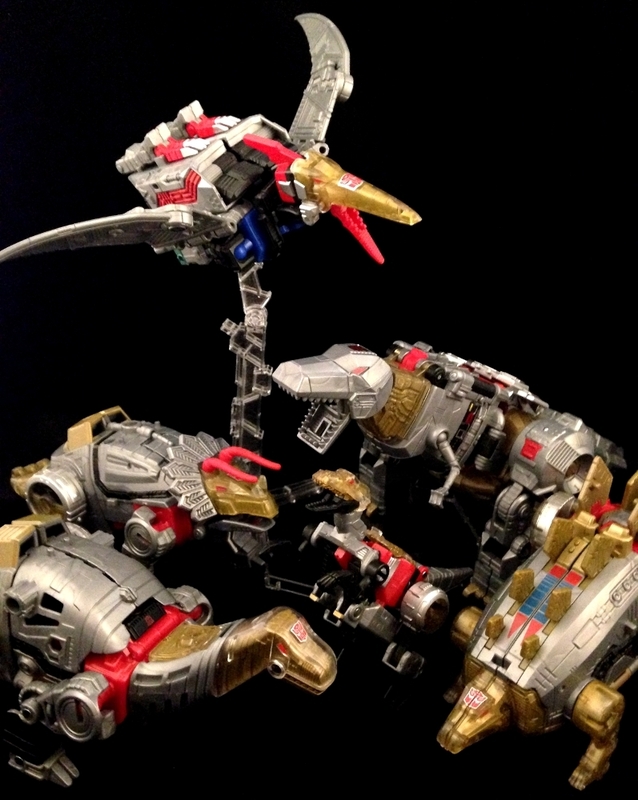 Check out our other Dinobot Reviews!